In the Summer of 2011, the residents of Modesto were greeted with the smiling faces of their neighbors. In shop windows and vacant offices throughout downtown, larger than life sized portraits appeared. Who were these people? Why were they there? 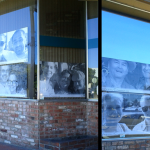 The portraits of over 125 visitors, residents, and local business people were displayed between 10th and 11th street down I street as part of a new public art project, Meet Your Neighbor. The idea behind the project was to allow people who work or visit downtown Modesto a chance to get to know others that they worked and shopped alongside. The project was a collaborative project from the Modesto Art Museum’s Building a Better Modesto program, and artist Jessica Gomula’s Building Imagination Initiative. The Modesto Art Museum’s program, Building a Better Modesto, explores the place of the visual arts in creating a more livable Modesto. The //Building Imagination Initiative also fosters an artistic response to Modesto’s ranking as the most unlivable city in the country. Its goal is to con­front a poverty of imagination by using art – videos, architecture, design, and game­play — to inspire creative solutions to the California Central Valley’s many quality of life problems. The resulting Meet Your Neighbor public art project was designed to help draw people downtown, and allow residents to see the people who help make up our diverse community, and to give residents an example of how public art can enhance their community. To make the project possible, artist Jessica Gomula partnered with the Modesto Art Museum. 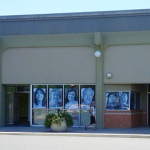 Going from business to business, Gomula collected the smiling portraits of over 50 local business owners and employees. 75 more portraits were garnered during the July Third Thursday Arts Walk, as passers by were asked if they would like to be part of a public art project. 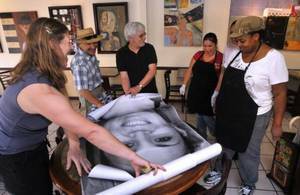 Then, on August 4th, the black and white, larger than life sized posters of Modesto residents went up. The buzz created by the project was immediately supportive, with several articles featured in the local Modesto Bee, an interview from the online Modesto News, as well as on the local cable channel. 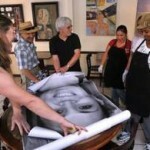 The images were on display from August 4 through the Modesto International Architecture Festival, in mid-September. Several business and property owners have kept the art project as an ongoing display in vacant offices. The final project allowed the art to be available for viewing by the public, 24 hours a day, 7 days a week. The experience itself was created through the direct participation of Modesto residents, and most importantly, the art gave residents the opportunity to see their community differently. The project was funded in part through grants from the Teichert Foundation, and California State University Stanislaus. The project would not have been possible without the support of the Downtown Improvement District, or the support of the more than 35 downtown shops and businesses.